Gastonia burgei, a polacanthine ankylosaur (about 16 feet long) collected at the Lower Cretaceous Gaston Quarry (Yellow Cat Member, Cedar Mountain Formation) northeast of Arches National Park and on exhibit at the Prehistoric Museum in Price, Utah. Photo courtesy of Francois Gohier. Utah is famous for its many dinosaur localities spanning the Mesozoic Era (the Age of Dinosaurs). However, of all Utah’s dinosaur species, one group is truly unappreciated: the Ankylosauria. These were heavily armored, tank-like, plant-eating dinosaurs characteristic of the Cretaceous Period (65–145 million years ago). Ankylosaurs were so well protected that even their eyelids were armored. Historically, ankylosaurs are best known from the last 10–15 million years of the Cretaceous and have traditionally been split into two taxonomic families. The family Ankylosauridae is known for having distinctive tail clubs and boxy skulls, where the openings in the sides of the skull characteristic of other dinosaur groups are closed off and the bony armor covering the skulls includes spines at the back of the skull above and below their eyes. The family Nodosauridae never had tail clubs, typically had large shoulder spines, and had more simple, “pear-shaped” skulls lacking spines and retaining the openings in the sides of the skull behind the eyes. These two families also differ in their distinctive shoulder blades (scapula) and lower pelvic bones (ischia). This two-part classification scheme held up well until the discovery of new ankylosaur species in the Upper Jurassic and Lower Cretaceous of eastern Utah and westernmost Colorado, which provided important insights on ankylosaur evolution that complicated this simple story. The first ankylosaur to be described from Utah was a large tail with massive triangular spines and massive bone plates. It was discovered by Lin Ottinger of Moab, Utah, in the early 1960s in the Poison Strip Member of the Early Cretaceous-age Cedar Mountain Formation west of Arches National Park. This distinct specimen is known as the Bodily “Hoplitosaurus” for Brigham Young University student N.M. Bodily who compared the specimen with the smaller and poorly known Hoplitosaurusfrom the Lower Cretaceous of the Black Hills region of South Dakota. In 1989, J.I. Kirkland discovered the first fairly complete Jurassic ankylosaur, Mymoorapelta, just over the state line in the Morrison Formation of westernmost Colorado. Within a week of this discovery, he learned of a similar dinosaur discovered by Robert Gaston, now of Fruita, Colorado, northeast of Arches National Park. As it turned out, this dinosaur was from the basal Yellow Cat Member of the Cedar Mountain Formation. The presence of a shield of fused armor over the hips (sacral shield) and distinctive triangular spines running down each side of its tail revealed that this new species, Gastonia burgei, was closely related to Polacanthus foxi, from nearly age-equivalent rocks on the Isle of Wight in southern England. Gastonia is now the best known member of a subfamily of primitive ankylosaurids known as the Polacanthinae that also includes Hoplitosaurus; the Bodily ”Hoplitosaurus”; the third dinosaur ever named, Hylaeosaurus; and a number of other undescribed new species from the lower and middle Cedar Mountain Formation. 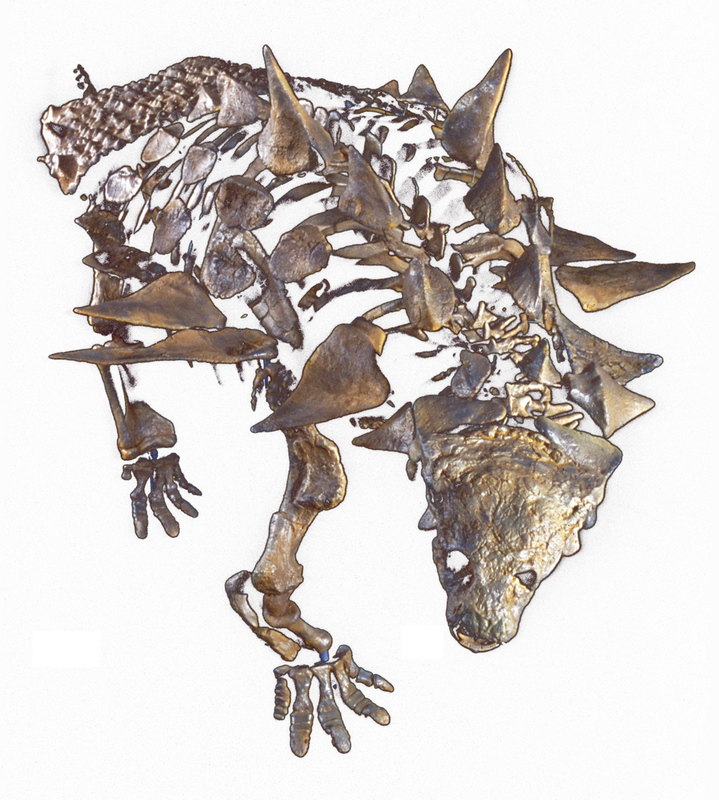 Utah’s first nodosaurid was discovered by University of Utah radiological technician Ramal Jones in 1994 by mapping lowlevel radiation across a dinosaur quarry near the top of the Cedar Mountain Formation east of Castle Dale, Utah. Animantarxramaljonesi was the first and is still the only dinosaur discovered solely by technology and not by seeing bone fragments on the ground surface. While the rocks preserving these fossils date from the beginning of the Late Cretaceous, larger nodosaurids are also known in the older Ruby Ranch Member of the Cedar Mountain Formation from near the end of the Early Cretaceous. One of these is the near elephantine-sized Peleroplites cedrimontanus described by Ken Carpenter (current director of the Prehistoric Museum, Price, Utah) in 2008 from the Prehistoric Museum’s Price River Quarries. The Price River Quarries have also yielded North America’s only Lower Cretaceous ankylosaurid, the elephantine-sized Cedarpelta bilbyhallorum. Cedarpelta has closed off the opening in the skull behind the eye and has straightened the ischium as in more advanced ankylosaurids from the Upper Cretaceous, as is the case with the similar Lower Cretaceous ankylosaurids Shamosaurus and Gobisaurus from Asia. Likewise, Cedarpelta is primitive in that it had an elongate, weakly ornamented skull, and no evidence of a tail club. 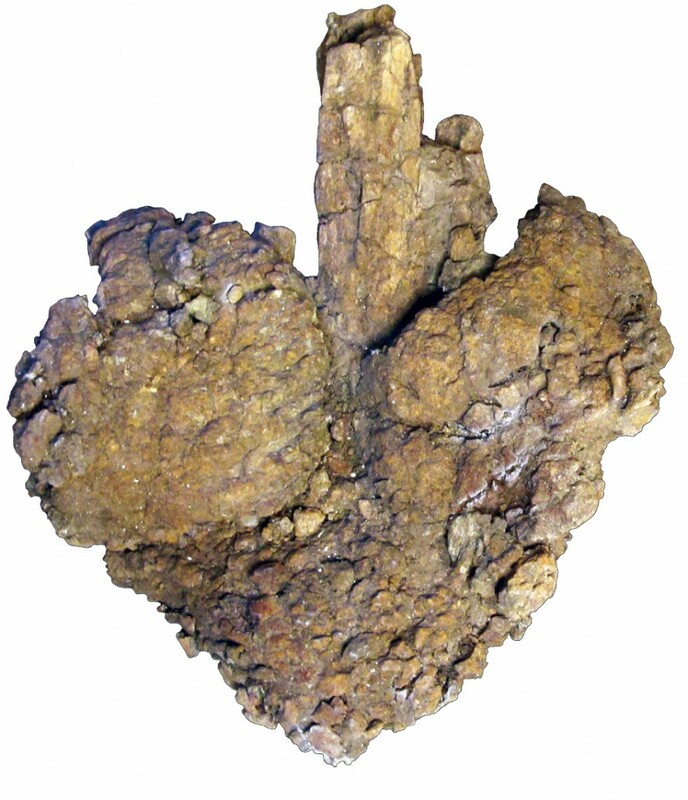 Given that there are fossils indicating several additional, but as yet undescribed, ankylosaur species in the Cedar Mountain Formation, it becomes clear that the Cedar Mountain Formation of Utah preserves more species of ankylosaur than any other geologic formation in the world. However, Utah’s other major dinosaurian frontier, the Upper Cretaceous rocks of Grand Staircase–Escalante National Monument (GSENM), is beginning to also yield evidence of a rich ankylosaurian record. The distinctive armor of nodosaurids has been collected from the Straight Cliffs, Wahweap, and Kaiparowits Formations of GSENM. However, the Utah Museum of Natural History’s recent ankylosaurid discoveries in the Kaiparowits Formation are the most significant amkylosaur finds to date. They have found evidence, based primarily on forelimbs and tail clubs, that two species of ankylosaurid coexisted during Kaiparowits time (around 76 million years ago). One site preserves much of a large animal including a well-preserved skull and a complete tail club. Still under study, portions of this important discovery will be exhibited in the new Natural History Museum of Utah in Salt Lake City when it opens in late 2011.